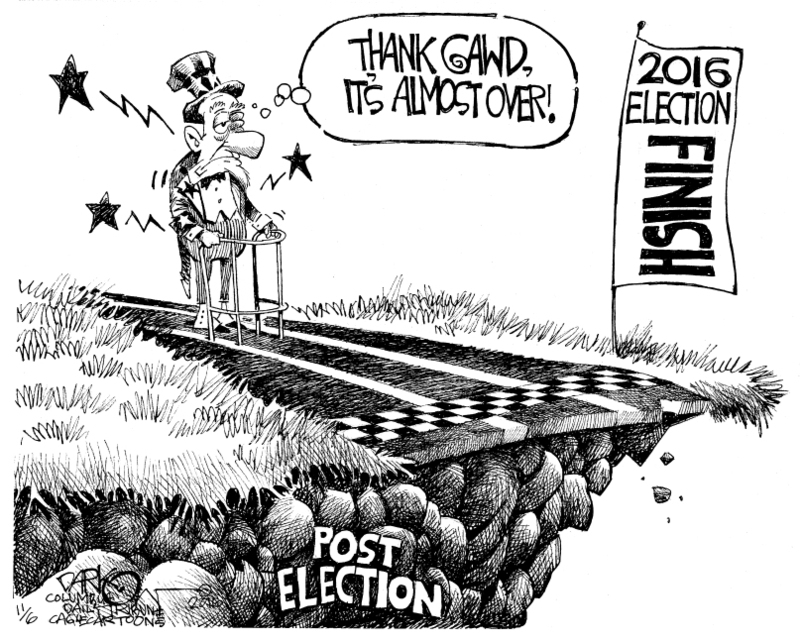 Home › Politics › Election 2016 › Was it worth it? This is exactly right. I did not laugh. No, kidding. A year ago I thought this would be great! Tons of material about Trump to make him look like the idiot he is. But as time went on, my interest dropped because I’m so sick and tired of his blatant lies that the media, and others, simply does not call him on. I haven’t watch the news for nearly a week now, which is very very unlike me. I just cannot stand to hear Trump’s voice even for 2 seconds. I cannot wait until tomorrow. I feel exactly the same way. I normally have CNN on in the background all day, but I stopped that about two weeks ago. I’m sick of hearing all the endless speculation and sickest of all of seeing or hearing Trump. His face and voice and attitude are sickening. Hillary’s not much better, with every word and gesture so scripted. I’m sick of it all. The endless “news,” the phone calls, the commercials, the junk mail. And to make it worse, there are some ballot issues here that I really care a lot about. Obviously this cartoon is not meant to be humorous, but to show the tragedy that the Presidential election has become this year, as such it is spot on! We get a lot of great, and quite serious, commentary from our editorial cartoonists. This is one of those “truth hurts” illustrations. It never ceases to amaze, the astuteness of cartoonists, they say more with one small drawing, than all the Ludlam’s say, in a thousand pages. “A picture is worth a thousand words.” The trick is coming up with the right picture at the right time. Yes; but how the hell do they do it with such accuracy; that’s what amazes me. I’ve been trembling for months. Now I’m about to throw up.